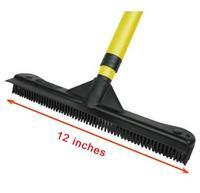 This 12" wide broom has extremely durable natural rubber bristles that will clean up virtually any debris in one simple motion. Won't wear out like a bristle broom and it's easy to clean with just soap and water. The built-in squeegee works great on windows and garage floors. Use wet or dry for the most demanding clean up jobs. Even removes light snow from walks and vehicles. Great for garage, deck, driveway, pool, sidewalk, hair salons, barber shops, pet groomers, and more. 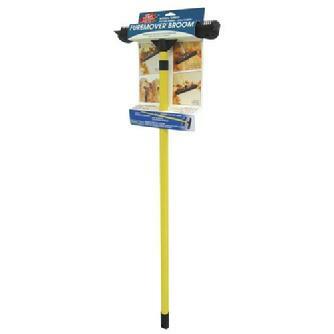 Includes a 60" steel telescopic handle. * Ideal for removing hair, lint, dust, dirt, and more from clothing, upholstery, carpets, and rugs. Also revitalizes carpet. * Fully washable and hygienic, 60" telescoping handle. * Great for veterinarians, pet groomers, and hair salons. Our Top 4 Products - Perfect for Holiday Cleaning!